The Baby Boomer voting-eligible population peaked at 73 million in 2004. Since the Boomer electorate is declining in size and the Millennial electorate will continue to grow, mainly through immigration and naturalization, it is a matter of time before Millennials are the largest generation in the electorate. (But) Millennials have punched below their electoral weight in recent presidential elections. (young adults are less likely to vote than their older counterparts.) Turnout among Millennials in 2016 was 51%, lower than the 61% of the electorate who voted. Millennials, who are projected to surpass Baby Boomers next year as the United States’ largest living adult generation, are also approaching the Boomers in their share of the American electorate. As of November 2016, an estimated 62 million Millennials (adults ages 20 to 35 in 2016) were voting-age U.S. citizens, surpassing the 57 million Generation X members (ages 36 to 51) in the nation’s electorate and moving closer in number to the 70 million Baby Boomers (ages 52 to 70), according to a new Pew Research Center analysis of U.S. Census Bureau data. Millennials comprised 27% of the voting-eligible population in 2016, while Boomers made up 31%. 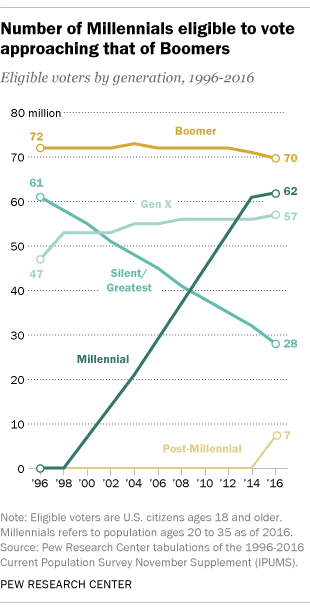 In 2016, Generation X and members of the Silent and Greatest generations (ages 71 and older) comprised 25% and 13% of the electorate, respectively. In addition, the oldest members of the post-Millennial generation (those born after 1996) began to make their presence known for the first time – 7 million of these 18- and 19-year-olds were eligible to vote in 2016 (comprising just 3% of the electorate). The Baby Boomer voting-eligible population peaked in size at 73 million in 2004. Since the Boomer electorate is declining in size and the Millennial electorate will continue to grow, mainly through immigration and naturalization, it is only a matter of time before Millennials are the largest generation in the electorate. While the growth in the number of Millennials who are eligible to vote underscores the potential electoral clout of today’s young adults, Millennials remain far from the largest generational bloc of actual voters. It is one thing to be eligible to vote and another thing to actually cast a ballot. Measuring voter turnout is not an exact science. The Census Bureau’s November voting supplements are a standard data source for illuminating the demographics of voting. Census estimates of voter turnout are based on respondent self-reports of whether they voted in the recent election. Given the historical context of relatively low voter turnout among young adults, Millennials seemed ascendant in the 2008 election when 50% of eligible Millennials voted. By comparison, 61% of the Generation X electorate reported voting that year, as did even higher percentages of Boomer and Silent Generation eligible voters. In 2008 Millennials comprised 18% of the electorate, but as a result of their relatively low turnout (compared with older generations) they made up only 14% of Americans who said they voted. Millennial turnout was less impressive in 2012, when 46% of eligible Millennials said they had voted. Since the oldest Millennials were age 31 in 2012 (as opposed to 27 in 2008), the expectation might have been that turnout would have edged higher. After all, an older, more mature, more “settled” age group presumably should turn out at higher rates. This underscores that young adult turnout depends on factors besides demographics: the candidates, the success of voter mobilization efforts, satisfaction with the economy and the direction of the country. Turnout among Millennials was higher in 2016 – 51%. But again, that’s significantly lower than the 61% of the electorate who voted. In order for their voting clout to match their share of the electorate, roughly 61% of Millennials would have to have turned out to vote in 2016. While it may be a slam-dunk that Millennials will soon be the largest generation in the electorate, it will likely be a much longer time before they are the largest bloc of voters.